It is becoming more and more popular to see people sipping on a fine dram of single malt whisky, and if you are reading this, I would guess that you enjoy a dram, or are looking to learn more about appreciating the spirit so here is a great starting block! Whisky has not just been popular for the last few decades, it has been popular for an incredibly long time, a few millennia to be precise, so if you have no idea what it is I would be surprised. Most people grow up knowing that some of the best whisky (if not all) comes from Scotland, from our little-rugged corner of the globe we sell whisky to every other corner, encompassing around 200 different countries! We have been making whisky in Scotland since around the 5th century, if not even earlier, granted Scotch Whisky today is nothing like the whisky they were drinking back then. It was not even called Whisky, it was called “Uisge Beatha” meaning the “Water of Life”. It sounds very romanticised, and our ancestors believed it was the purest form of anything! It was the 5th element. They were confident that drinking it would prolong life, cure disease and improve your general wellbeing – sounds good to me! However, the stuff they were drinking would most likely make you have a great night and turn you blind! Thankfully, we are now better at making it. The process is the same, we have merely worked out the kinks. Using only 3 simple ingredients: water, yeast and malted barley we can craft a neutral spirit called “The Heart”, this is then left to sleep in oak casks for a bare minimum of 3 years, whilst the angles take their share. Then we have a bottle of Single Malt Scotch Whisky. Ready to be savoured and enjoyed, responsibly. I could go on about production for pages and pages, but I won’t bore you with that. 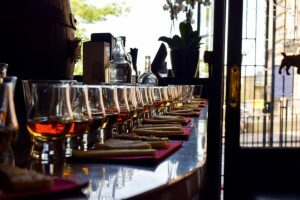 To learn more about how you create our national spirit I highly recommend a tutored tasting in our loverly shop – see here to book and then taking a trip to some of the many incredible distilleries. Book yourself on a tour and experience first-hand how we make Whisky, watch as the craftsmen and women use their expertise to produce the perfect dram. You will then start to notice the nuances that make each distillery, and their product, completely different to their neighbours. Enjoying whisky for the first time is difficult. We have all had that one (possibly more) bad experience in our parents drinks cupboard, having a generous sip of whisky and realising that this golden brown liquid with years of craftsmanship burns! Trying to enjoy whisky after an experience like this is difficult. Thankfully the older we get, we realise alcohol is not necessarily something to gulp down as quickly as possible. Instead, nosing the spirit, taking in its wonderfully powerful aromas we realise it brings back memories. Sipping the whisky slowly, creates this wonderful texture. Then the lingering flavours left on your palate dance and change. What you are left with is a reminder of the dram you just enjoyed, and a warmth that passes down your throat and through your body. Step 1 – Look at the whisky, before you try it take in its colour, the way the oils swirl in the glass (tricky to resist I know). Step 2 – Nose the whisky, breath it in and you will experience all the years it has been improving during maturation (still no drinking yet). Step 3 – Sip the dram (FINALLY!). Step 4 – The finish, try and focus on the flavours the whisky leaves behind after you drink it, they will change and develop. Step 5 – Add water, a couple drops of water “open” the whisky. Now, you get to enjoy repeating steps 1 – 4, only now consider how the whisky compares. Keep it personal, the whisky is for you to enjoy. Drink it how you like it. Finally, here in Scotland when we share a few whiskies together we raise our drams and say Slàinte Mhath! (Your good health).